Is your home bar not yet fully stocked? Do you have a friend who’s looking for a few wine or barware accessories? This list of the top barware and wine tool gift ideas is just what you need to get started building a complete home bar. In this list, you’ll find gifts that are perfect for everyone on your list, whether your friends are jet-setters or prefer to enjoy a drink at home. Coasters, glassware, aerators and more comprise this list, and you’ll love that each product is eco-friendly, fair trade and socially responsible. Every barware gift on this list is available through Amazon, so stock up. Ordering all from Amazon will ensure that your order is packed to combine shipping, reducing the carbon footprint of your order even further. Imagine for a moment that you’ve invited dinner guests for a quiet evening at home. The vegetarian lasagna is ready, the salad is chopped and prepared to serve and your guests have just arrived. Suddenly, you realize: you’ve forgotten to aerate the wine. If you’ve found yourself in a similar situation, this Vintorio review is what you need. Vintorio is a one-product business, focusing solely on their flagship product. The Vintorio wine aerators negates the need to let your wines breathe. Instead, you’ll just attach the pourer to the bottle and your wine is instantly aerated to perfection. The Vintorio Aerator Pourer is made from quality materials, something the company has made sure of. All pourers are made under fair trade conditions which are FDA approved to be safe. Customers who have bought the aerator say the product is virtually drip-proof. The customer service at Vintorio is also phenomenal, with most consumer questions handled within one business day. You’ve probably heard of Oster; the company is known for small appliances like toasters, blenders and countertop ovens. What you may not know, however, is that Oster is a socially responsible, give back company. It’s actually a subsidiary brand, owned by parent company Jarden. Jarden is a fair trade company that launched the JCS Community Fund. This fund supports efforts to improve the lives of at-risk individuals in the United States. For our Oster review, we’ve chosen this cordless electric wine bottle opener as one of our favorite wine tools and wine accessories. It’s an energy saving tool – just charge it up once and the battery will last through up to 30 bottles of your favorite wine. Bring the bottle opener to the table with you at your next gathering; there’s no need to be tied to the kitchen. The Oster Cordless Electric Wine Bottle Opener also features a foil cutter. No matter what you’re serving, this wine bottle opener is convenient and easy to use. If you’re shopping for a gift for the whiskey aficionado in your life, look no further than this Cool Stones review. This whiskey gift set is absolutely gorgeous. Housed in a natural wood display case, you’ll find two crystal glasses, eight granite chilling rocks and stainless steel tongs. Your set also includes two free coasters. Whiskey drinkers know that ice can do some serious damage to the drink’s natural flavor profile. Instead of watering down your whiskey, pour a finger over these chilled granite stones. Your beverage will stay cool for as long as you need, and will never be watered down with Cool Stones. This set is perfect to give as a gift, but affordably priced; buy one for yourself, too! The kit is made from natural and recyclable materials and comes with a 30 day money back guarantee if you’re dissatisfied for any reason. Do you prefer your drinks “shaken, not stirred?” If so, you’re going to love this FINEDINE review. FINEDINE is a family-owned and operated business dedicated to creating high-quality, sustainable products. This Home Bar Set is no exception. The Home Bar Set from FINEDINE includes a full 14 pieces. Everything you need to make your favorite drink is included, no matter what that drink may be. In your set, you’ll find shaker tins, jiggers, a bottle opener, pour spouts, shot glasses and a bar spoon. Just add your favorite liquor! Crafted from recyclable stainless steel, this bar set is the perfect way to make martinis, margaritas or just a good Old Fashioned. The kit’s easy to clean, too. All pieces are dishwasher safe, so post-drink cleanup is a breeze. On a hot summer day, there’s little more relaxing than a frozen margarita, Jimmy Buffet-style. Cool off and relax with our Margaritaville review. This frozen drink maker features a 36-ounce blending jar, so there’ll be plenty to share. What customers love about the Margaritaville Bahamas Concoction Maker is that it’s extremely easy to use. The No-Brainer Mixing Tool lets you easily add the right amount of each ingredient in your recipe, whether you’re making a pina colada, a margarita or a daquiri. Ice is a no-brainer, too. The machine’s 400 watts of power will shave your ice to perfection. Margaritaville is an American company. The company offers branded merchandise ranging from beach chairs to reading glasses. Be sure to combine shipping on your orders to reduce your carbon footprint! Previously, we covered a whiskey stone set that was perfect for gift giving. While our Thorsen Tavern review does feature a gift product, we think you’re going to just want to buy a few for yourself. 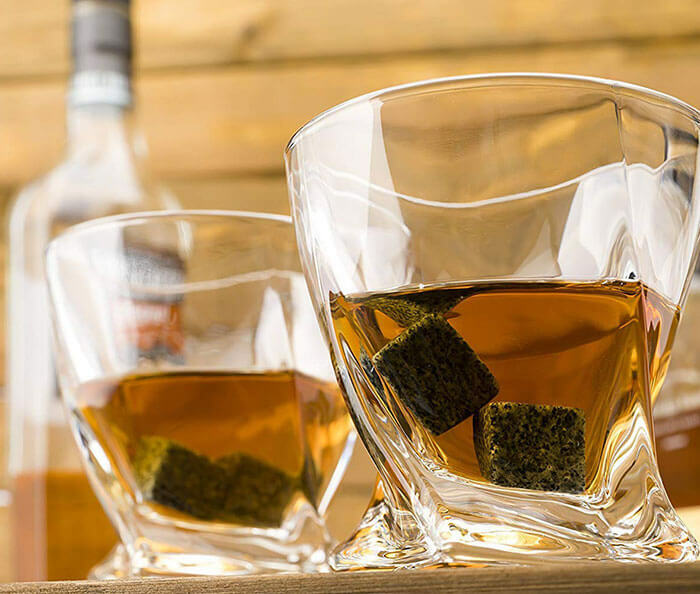 The Whiskey Stone Set by Thorsen Tavern is nothing short of beautiful. Nine granite stones are etched with the company logo and have been tumbled to a smooth, polished shine. The process used to finish the stones are guaranteed not to scratch your fine whiskey glasses. The Thorsen Tavern Whiskey Stone Set also includes tongs for hygienic handling of your stones. Granite is non-porous, so you can reuse these chilling stones over and over without fear of changing the flavor of your bourbon, scotch or Jameson. What do you give the person who has everything? A City Map Coaster Set, of course. This set by O3 Design Studio isn’t just a collection of coasters. They’re great gifts that can be customized to be meaningful, sentimental keepsakes for your favorite couple or the loved ones in your life. 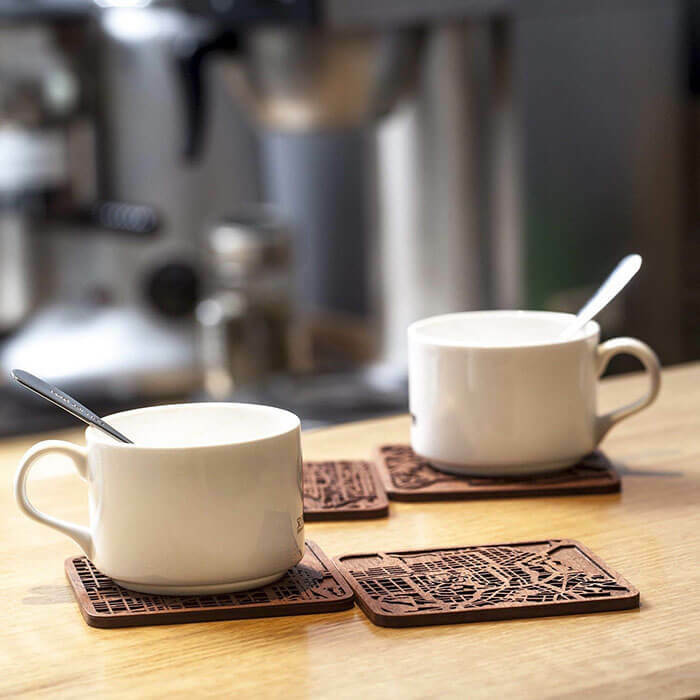 Our O3 Design Studio review features a set of 4 coasters which are made from natural Sapele wood. Completely biodegradable and sustainable, these coasters will last a lifetime in your loved one’s bar. What we love most about this set, though, is that you can choose from a huge list of cities, from Nashville to Amsterdam. A map of your chosen city will be imprinted onto the coaster. Each coaster set is handmade; it’s carved, polished, burnished and painted over a two week period. Customers who have purchased the set say they’re great anniversary gifts. Just choose the city where the couple met; your recipient will love this memorable gift. When you’re stocking your bar, you need all the right glasses. You’ll have martini glasses, sherry glasses and champagne flutes. You’ll also need glasses for red and white wines. Do you think you have everything? What about whiskey glasses? 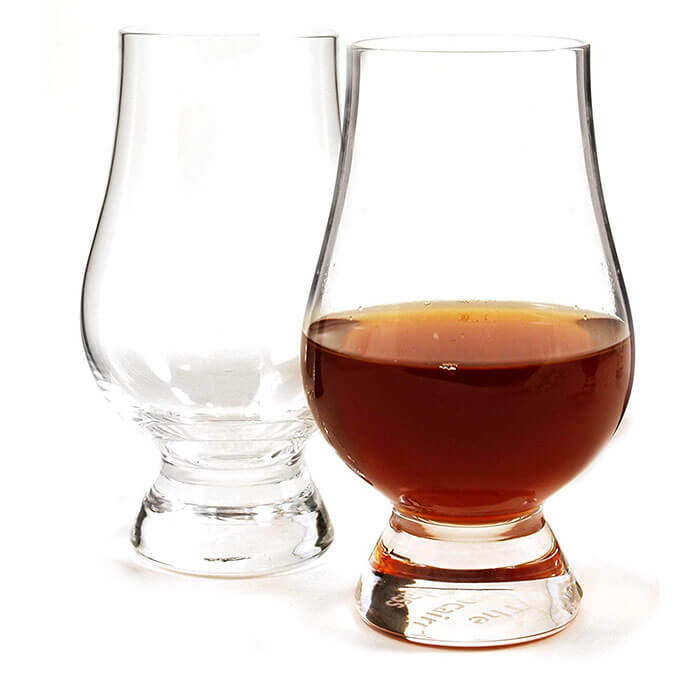 This Whiskey Glass Set from Glencairn Glass is quite possible what your bar is missing. The non-leaded crystal glass set is the perfect shape to enjoy the aroma and flavors of your favorite bourbon, scotch or Jameson. Featuring a sturdy base, the glass is easy to hold and a tapered mouth allows you to sip without drips. As we researched for this Glencairn Glass review, we learned that this whiskey glass is at the heart of the company. An American business based in Cincinnati, Ohio, Glencairn Glass has dedicated its design efforts into the enjoyment of one drink: whiskey. Each award-winning product sold by the company is made to allow customers to fully appreciate the flavor and notes of their favorite whiskey. Even the most well-stocked bars have one thing in common: they’re not portable. What do you do if you’re traveling and want to bring your favorite drink with you? If you want to entertain – or just enjoy a good drink – on the go, this W&P review is for you. W&P is an American small business, launched by two friends in 2012. The company began with the creation of a shaker and since then the catalog has expanded to include barware, sustainable storage solutions and travel kits like these. Choose from your favorite drinks – W&P sells kits to make Bloody Marys, gin & tonics, margaritas and more – and enjoy cocktails on the go. Each kit is TSA approved, so you can even carry them on to your flight. Your kit includes everything you need to mix your drink, from aromatic bitters to a travel-sized jigger. Travel kits are sold in sets of two, so gift one to a friend. Mixology & Craft is one of the United States’ leading suppliers of barware. From recyclable, sustainable cocktail shakers to gifts and complete barware sets, Mixology & Craft offers a wide range of eco-friendly, durable tools for your home bar. For our Mixology & Craft review, we’ve chosen this set of two liquor pourers. Made from 18/8 stainless steel, the pourers are guaranteed never to rust. The pourers are designed to fit any bottle, whether you’re pouring your favorite red or a smooth gin. The sustainable, recyclable liquor pourers come in sets of two or four. Customers who have bought the Mixology & Craft sets say the pourers aren’t just ideal for alcoholic beverages, but work great for vinegar, olive oil and other kitchen staples. Every set comes with a lifetime guarantee; Mixology & Craft offers full refunds if you’re not satisfied with your barware. Next on our list of the top barware and wine tool gift ideas is out Barillio review. Barillio offers a 100% satisfaction guarantee on each of its products. However, we know you’re going to be completely happy with your bartender set. 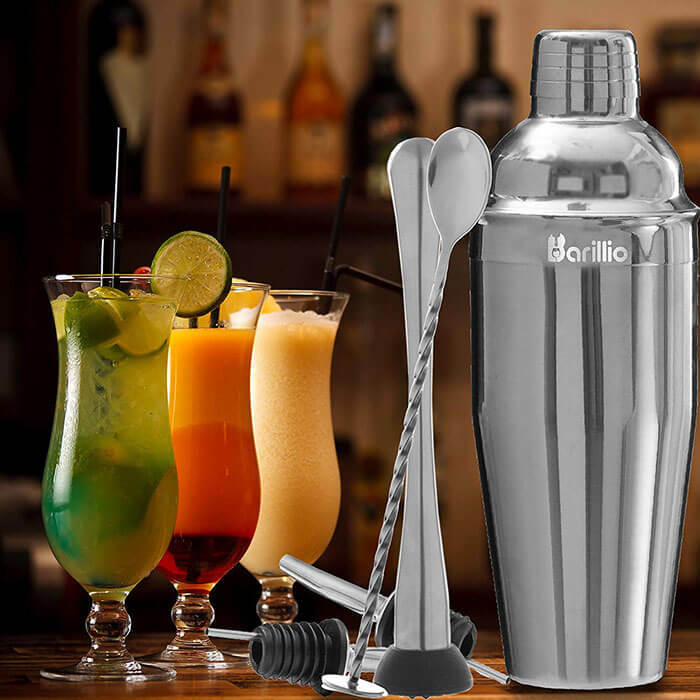 The Elite Cocktail Shaker Kit contains everything you need to mix up martinis, cocktails and mocktails. In your kit, you’ll find an SST Cobbler shaker, a mojito muddler, a mixing spoon, two liquor pourers and a double jigger. All items are packed carefully inside a velvet bag, making it the perfect gift. The stainless steel products are sustainable, eco-friendly and rust-proof. Customers who have bought the set say the design is sleek and beautiful, and they love the included recipe booklet! OXO is one of the most well-known names in kitchenware. The company creates everything from sink strainers to can openers, and the products are often lauded for their quality. Many OXO offerings are made from recyclable, sustainable steel, including the steel double jigger we’ve chosen for our OXO review. This simple little jigger allows you to get the perfect measurement every time. Measurements are laser-etched into the steel, and include measurements from ¼ ounce to 1 ½ ounces. The non-slip grip allows you to grasp the jigger easily, and the product is easy to care for, as it’s dishwasher safe. As we researched OXO, we discovered the company supports Cookies for Kids’ Cancer. This non-profit raises money to support research and treatment for pediatric cancer. Employees are encouraged to volunteer with the group, and OXO supports Cookies for Kids’ Cancer financially also. Whether you’re entertaining friends or just sipping sherry on a fall night, you’re going to want to protect your furniture. If you’re looking for the perfect coaster set, this Teocera review is just what you need. This set of six coasters is made from eco-friendly ceramic stone and backed with sustainably harvested cork. The set is a great earth-conscious addition to your home, and makes a great gift. Choose from three designs; our favorite is mandala but you may prefer Old Glory or White and Blue. The coasters are easy to clean – the frosted glaze allows you to simply rinse with water. The coasters measure four inches across, offering plenty of room for even your red wine glasses. Teocera has committed to making these coasters as eco-friendly as possible. The coasters are made under fair trade conditions using low carbon, non-toxic materials. Of course, reusable coasters are much more earth-friendly than disposable coasters, so keep these on hand! Next on our list of the top barware and wine tool gift ideas is our CUSIBOX review. This energy-saving, eco-friendly electric wine bottle opener is perfect to have on hand for dinner parties, and will stay charged through 30 or more bottles. Just charge it up overnight and the CUSIBOX bottle opener will last for weeks. There’s a lot to love about wine tools like this electric bottle opener. First, it’s made from stainless steel. That means the bottle opener is durable, will last a lifetime and won’t rust. We also love the LED light. Even if you’re dining by candle light, the LED will allow you to open your bottles without fear of spills. CUSIBOX is sure you’re going to love your purchase; each bottle opener comes with a 100% satisfaction guarantee. Customers who have bought the CUSIBOX electric bottle opener say it’s a great gift, and that the bottle opener is powerful, working effortlessly right out of the box. The final product on our list of the top barware and wine tool gifts is our Amici Home review. This set of four glasses is perfect for your Double Old Fashioned, but customers say the glasses are great for sipping sweet tea, too! You’ll love the grip you get on the glasses, which feature an ergonomic design. Your set of Amici Home Double Old Fashioned glasses are handmade in Mexico under fair trade conditions. Even better, the glassware is made from recycled glass, an eco-friendly choice. Amici is an American company, but the group works closely with global artisans to provide handmade, fair labor products that are designed to last.